This year, about 12,750 people (7,240 men and 5,510 women) will be diagnosed with STS in the United States. An estimated 5,270 adults and children (2,840 males and 2,430 females) are expected to die of the disease this year. Sarcomas are described as being localized, regional, or metastatic when they are first found. Localized means the tumor is only in 1 area of the body. Regional means the tumor involves tissues in a localized area, and there is also a tumor in or attached to nearby tissues or organs. Metastatic means the sarcoma has spread to parts of the body far away from where the sarcoma started. When the sarcoma starts in an arm or a leg, the 5-year survival rates are slightly higher for each stage when compared with sarcoma that starts in other locations. This section includes information on how often sarcomas show up as localized, regional, or metastatic. In addition, there is information on survival rates for each situation. This information applies for sarcomas in general and may not apply to a specific type of sarcoma. Talk with your health care team for more information regarding your specific diagnosis. In general, cancer statistics often include the 5-year survival rate for a type of cancer. The 5-year survival rate tells you what percent of people live at least 5 years after the cancer is found. Percent means how many out of 100. The overall 5-year survival rate for sarcoma is about 65%. About 58% of sarcomas are found as a localized sarcoma. The 5-year survival rate for people with localized sarcoma is 81%. About 18% of sarcomas are found in a regional stage. The 5-year survival rate for people with regional stage sarcoma is 58%. About 14% of sarcomas are found in a metastatic stage. The 5-year survival rate for people with metastatic sarcoma is 16%. It is important to note that the length of time a person lives with sarcoma depends on many factors, including the type of sarcoma, the size, where it is located, and how quickly the tumor cells are growing and dividing, called the grade. If the sarcoma is found at an early stage and has not spread from where it started, surgical treatment is often very effective and many people are cured. On the other hand, if the sarcoma has spread to other parts of the body, treatment can usually control the tumor, but it is not often curable. Learn more in the Stages and Grades section. It is also important to remember that statistics on the survival rates for people with STS are an estimate. The estimate comes from annual data based on the number of people with this cancer in the United States. Also, experts measure the survival statistics every 5 years. So the estimate may not show the results of better diagnosis or treatment available for less than 5 years. Talk with your doctor if you have any questions about this information. Learn more about understanding statistics. Statistics adapted from the American Cancer Society's (ACS) publication, Cancer Facts & Figures 2017: Special Section – Rare Cancers in Adults, and the ACS website (January 2019). The next section in this guide is Medical Illustrations. It offers drawings of body parts often affected by STS. Use the menu to choose a different section to read in this guide. 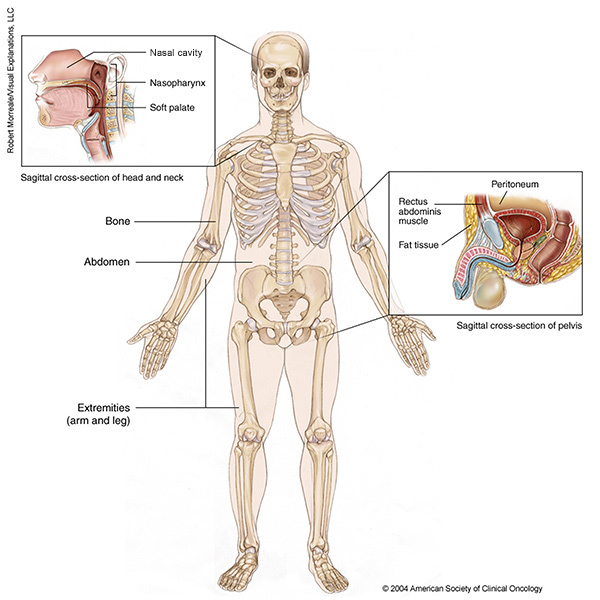 This illustration shows areas in the body in which soft-tissue sarcomas are likely to occur. In the head and neck area, this includes the nasal cavity, which is the air filled cavity behind the nose; the nasopharynx, the air passageway at the upper part of the throat behind the nose; and the soft palate, at the back of the mouth just in front the nasopharynx. The illustration also highlights the skeleton, abdomen, and extremities (arms and legs). A sagittal cross-section of a male pelvis shows the peritoneum, the membrane that lines the abdominal cavity and organs; the rectus abdominis muscle, which runs down the front of the abdomen; and the fatty tissue that covers the rectus abdominis muscle. Copyright 2004 American Society of Clinical Oncology. Robert Morreale/Visual Explanations, LLC. Previous radiation therapy. People who have been treated with radiation therapy for a previous cancer have a slightly increased risk of later developing sarcoma. Genetics. People with certain inherited diseases have a higher risk of sarcoma. These diseases include neurofibromatosis type 1, also known as von Recklinghausen’s disease; Gardner syndrome; Werner syndrome; tuberous sclerosis; nevoid basal cell carcinoma syndrome; Li-Fraumeni syndrome; and retinoblastoma. Immune system abnormalities. People with problems with their immune system have a higher risk of several types of cancer. Sarcomas can occasionally happen in people with an abnormal immune system, whether from infections such as human immunodeficiency virus (HIV), cancers such as chronic lymphocytic leukemia, or autoimmune conditions such as lupus or psoriasis. Lymphedema. People who have surgery for other reasons may have swelling of an arm or leg as a side effect of the surgery. This is called lymphedema. For example, lymphedema is common after breast surgery, when lymph nodes are removed from the armpit area. People can also be born with lymphedema. Sarcomas, such as angiosarcoma, occasionally form in areas where lymphedema had developed. Chemicals. Workplace exposure to vinyl chloride monomer, which is used in making some types of plastics, Agent Orange, or dioxin, may increase the risk of sarcoma. However, most sarcoma is not known to be associated with specific environmental hazards. Sarcomas can start in any part of the body. The types of symptoms that people have from a sarcoma depend on where it starts. People with sarcoma may experience the following symptoms or signs. Sometimes, people with sarcoma do not have any of these changes. Or, the cause of a symptom may be a different medical condition that is not cancer. STS rarely causes symptoms in the early stages. The first sign of a sarcoma in an arm, leg, or torso may be a painless lump or swelling. As noted in Statistics, most lumps are not sarcoma. The most common soft-tissue lumps are lipomas. Lipomas are made of fat cells and are not cancer. Lipomas have often been there for many years and rarely change in size. In the uterus, benign tumors called fibroids, or leiomyomas, far outnumber sarcomas. However, it’s important to talk with your doctor about any lumps that are larger than 2 inches (5 centimeters), grow larger, or are painful, regardless of their location. People with sarcoma that starts in the abdomen may not have any symptoms, or they may have pain or a sense of fullness. Because STS can develop in flexible, elastic tissues or deep spaces in the body, the tumor can often push normal tissue out of its way as it grows. Therefore, a sarcoma may grow quite large before it causes symptoms. Eventually, it may cause pain as the growing tumor begins to press against nerves and muscles. Sarcomas that arise in other parts of the body may cause other symptoms or signs. For example, sarcomas that arise in the uterus can cause uterine bleeding or an increase in the size of the uterus. Tumors that start in the heart or lungs may cause breathing problems or pain in the chest. If sarcoma is diagnosed, relieving symptoms remains an important part of cancer care and treatment. This may also be called symptom management, palliative care, or supportive care. Be sure to talk with your health care team about the symptoms you experience, including any new symptoms or a change in symptoms. Doctors use many tests to find, or diagnose, cancer. They also do tests to learn if cancer has spread to another part of the body from where it started. If this happens, it is called metastasis. For example, imaging tests can show if the cancer has spread. Imaging tests show pictures of the inside of the body. Doctors may also do tests to learn which treatments may work best. For most types of cancer, a biopsy is the only sure way for the doctor to know whether an area of the body has cancer. In a biopsy, the doctor takes a small sample of tissue for testing in a laboratory. If a biopsy is not possible, the doctor may suggest other tests that will help make a diagnosis. Although biopsies have a small chance of not giving a definite answer, they are essential to allow your doctor make a clear diagnosis and develop a clear team-based treatment plan. There are no standard screening tests for sarcoma. A doctor should examine any unusual or new lumps or bumps that are growing to make sure it is not cancer. Sarcomas are rare. If sarcoma is suspected, it is very important to talk with a doctor who has experience with this type of cancer. Benign and cancerous tumors may look different on imaging tests, such as an x-ray. In general, a benign tumor has round, smooth, well-defined borders. A cancerous tumor usually has irregular, poorly defined edges. X-ray. An x-ray is a way to create a picture of the structures inside of the body, using a small amount of radiation. X-ray is particularly useful for bone sarcomas, but less valuable for STS. Computed tomography (CT or CAT) scan. A CT scan creates a 3-dimensional picture of the inside of the body using x-rays taken from different angles. A computer combines these images into a detailed, cross-sectional view that shows any abnormalities or tumors. A CT scan can be used to measure the tumor’s size. Sometimes, a special dye called contrast medium is given before the scan to provide better detail on the image. This dye can be injected into a patient’s vein and/or be a liquid the patient must drink. Magnetic resonance imaging (MRI). An MRI uses magnetic fields, not x-rays, to produce detailed images of the body. MRI can be used to measure the tumor’s size. A special dye called a contrast medium is given before the scan to create a clearer picture. This dye can be injected into a patient’s vein. MRI is a key test for doctors to decide whether a biopsy is necessary in cases of possible STS as well as to guide any surgical procedure. An MRI is generally viewed as necessary before any surgical procedure is performed. Positron emission tomography (PET) or PET-CT scan. A PET scan is usually combined with a CT scan (see above), called a PET-CT scan. However, you may hear your doctor refer to this procedure just as a PET scan. A PET scan is a way to create pictures of organs and tissues inside the body. A small amount of a radioactive sugar substance is injected into the patient’s body. This sugar substance is taken up by cells that use the most energy. Because cancer tends to use energy actively, it absorbs more of the radioactive substance. A scanner then detects this substance to produce images of the inside of the body. This technique can be used to look at both the tumor’s structure and how much energy is used by the tumor and normal tissues. This information can be helpful in planning treatment and evaluating how well treatment is working, but it is usually not be performed in all cases of known or suspected STS. Imaging tests may suggest the diagnosis of sarcoma, but a biopsy will be needed to confirm the diagnosis and to find out the subtype. It is very important for a patient to see a sarcoma specialist before any surgery or biopsy is done. Biopsy. A biopsy is the removal of a small amount of tissue for examination under a microscope. Other tests can suggest that cancer is present, but only a biopsy can make a reliable diagnosis. A pathologist is a doctor who specializes in interpreting laboratory tests and evaluating cells, tissues, and organs to diagnose disease. Because STS is uncommon, an expert pathologist should review the tissue sample to properly diagnose a sarcoma. Sometimes properly diagnosing a sarcoma requires special tests on the tumor tissue, and it is best if a specialist who sees this type of cancer every day does this. Molecular testing of the tumor. Your doctor or the pathologist looking at the sarcoma may recommend running laboratory tests on a tumor sample to identify specific genes, proteins, and other factors unique to the tumor. Results of these tests will help decide what the treatment should be, because each sarcoma can be as different from one another as breast cancer is different from colon cancer (see Treatment Options). ON THIS PAGE: You will learn about how doctors describe a cancer’s growth or spread, and how quickly it may grow. This is called the stage and grade. Use the menu to see other pages. Doctors use diagnostic tests to find out the cancer's stage, so staging may not be complete until all of the tests are finished. Knowing the stage helps the doctor to decide what kind of treatment is best and can help predict a patient's prognosis, which is the chance of recovery. There are different stage descriptions for different types of cancer. There are several systems used to describe the stage of sarcoma. These systems are somewhat different from each other, but all use an overall stage to help predict a person’s prognosis. The results are combined to determine the stage of cancer for each person. There are 4 stages: stages I through IV (1 through 4). The stage provides a common way of describing the cancer, so doctors can work together to plan the best treatments. STS in the trunk and extremities, which generally includes all of the body from the head down. STS in the retroperitoneum, which is roughly defined as the abdominal cavity. For TNM staging information for STS found in other parts of the body, visit the website of the American Joint Committee on Cancer. Please note that this link takes you to a separate, independent website. Using the TNM system, the "T" plus a number is used to describe the size of the tumor. T0 (T plus zero): There is no evidence of a primary tumor. T1: The tumor is 5 centimeters (cm) or smaller. T2: The tumor is larger than 5 cm but not larger than 10 cm. T3: The tumor is larger than 10 cm but not larger than 15 cm. T4: The tumor is larger than 15 cm. The "N" in the TNM staging system stands for lymph nodes. These tiny, bean-shaped organs help fight infection. Lymph nodes near where the cancer started are called regional lymph nodes. Lymph nodes in other parts of the body are called distant lymph nodes. STS usually does not spread to lymph nodes. N0 (N plus zero): The cancer has not spread to regional lymph nodes. M1: There is metastasis to another part of the body. Stage IA: The tumor is 5 cm or less in size. It has not spread to lymph nodes or to other parts of the body (T1, N0, M0, GX or G1). Stage IB: The tumor is more than 5 cm in size. It has not spread to lymph nodes or to other parts of the body (T2, T3, or T4; N0, M0, GX or G1). Stage II: The tumor is 5 cm or less in size. It has not spread to lymph nodes or to other parts of the body. The grade is higher than the grade for stage IA (T1, N0, M0, G2 or G3). Stage IIIA: The tumor is larger than 5 cm but not larger than 10 cm. It has not spread to lymph nodes or to other parts of the body. The grade is higher than the grade for stage IB (T2, N0, M0, G2 or G3). The tumor is larger than 10 cm. It has not spread to the regional lymph nodes or to other parts of the body. The grade is higher than the grade for stage IB (T3 or T4, N0, M0, G2 or G3). The tumor is located in the retroperitoneum and is any size. It has spread to the regional lymph nodes but not to other parts of the body (any T, N1, M0, any G). Stage IV: The tumor is any size, any grade, and may or may not have spread to the regional lymph nodes. It has spread to other parts of the body (any T, any N, M1, any G). This staging system applies to most types of STS, except Kaposi sarcoma; GIST; infantile fibrosarcoma; sarcomas that begin in the central nervous system, which includes the brain or the lining around the brain and spinal cord; and sarcomas that begin in an organ or a hollow organ, such as the bowel or urinary tract. Recurrent: Recurrent cancer is cancer that comes back after treatment. If the cancer does return, there will be another round of tests to learn about the extent of the recurrence. These tests and scans are often similar to those done at the time of the original diagnosis. Descriptions of the most common treatment options for sarcoma are listed below. Treatment options and recommendations depend on several factors, including the type, stage, and grade of sarcoma, possible side effects, and the patient’s preferences and overall health. Your care plan may also include treatment for symptoms and side effects, an important part of cancer care. Take time to learn about all of your treatment options and be sure to ask questions about things that are unclear. Talk with your doctor about the goals of each treatment and what you can expect while receiving the treatment. Learn more about making treatment decisions. Surgery is the removal of the tumor and some surrounding healthy tissue during an operation. Before surgery, it’s important to have a biopsy and appropriate imaging to confirm the diagnosis (see Diagnosis). After a biopsy, surgery is typically the first and main treatment for STS that is small and located in only 1 area. Surgical oncologists and orthopedic oncologists are doctors who specialize in treating STS using surgery. The surgeon's goal is to remove the tumor and enough normal tissue surrounding it to obtain a clean margin around the tumor. A “clean margin” means there are no tumor cells visible at the borders of the surgical specimen. This is currently the best method available to ensure that there are no tumor cells left in the area from which the tumor was removed. Small low-grade sarcomas can usually be effectively removed by surgery alone. Those that are high grade and larger than 2 inches (5 cm) are often treated with a combination of surgery and radiation therapy. Radiation therapy or chemotherapy may be used before surgery to shrink the tumor and make removal easier. They also may be used during and after surgery to destroy any remaining cancer cells. Rarely, for patients with a very large tumor involving the major nerves and blood vessels of the arm or leg, surgical removal of the limb, called amputation, is required to control the tumor. This can also be necessary if the tumor grows back in the arm or leg after surgery, radiation therapy, and/or chemotherapy have been completed. It’s important to remember that the operation that results in the most useful and strongest limb may be different from the one that gives the most normal appearance. If amputation is needed, rehabilitation, including physical therapy, can help maximize physical function. Rehabilitation can also help a person cope with the social and emotional effects of losing a limb. Patients who have had an amputation can often wear a prosthesis, depending on the type of amputation. Before surgery, talk with your health care team about the possible side effects from the specific surgery you will have, including the recovery period. Learn more about the basics of cancer surgery. Radiation therapy is the use of high-energy x-rays or other particles to destroy cancer cells. A doctor who specializes in giving radiation therapy to treat cancer is called a radiation oncologist. Since sarcoma is rare, it is very important to talk with a radiation oncologist who has experience treating sarcoma. Radiation therapy may be done before surgery to shrink the tumor so that it may be more easily removed. Or it may be done after surgery to remove any cancer cells left behind. Radiation treatment may make it possible to do less surgery, often preserving critical structures in the arm or leg if the sarcoma is located in one of those places. Radiation therapy can damage normal cells, but because it is focused around the tumor, side effects are usually limited to those areas. The way external-beam radiation is used has changed over the past 20 years. It is now possible to give many small beams of radiation that turn on and off as the radiation machine rotates around the body. This is called intensity modulated radiation therapy (IMRT) and is now typically used for sarcomas. IMRT focuses more radiation on the tumor site and less on the normal tissues. As a result, there are fewer side effects than there were in the past. Brachytherapy is the insertion of radiation seeds through thin tubes called catheters directly into the affected area of the body. Brachytherapy usually requires specialized skills and special training. It is only used in certain hospitals. The setup for brachytherapy usually starts in the operating room, where the catheters are placed. Tiny seeds of radioactive material, called low-dose-rate radiation seeds, are then slid into the tubes on wires for a set amount of time. At the end of the treatment, which lasts several days, both the radiation seeds and catheters are removed. People usually have to stay in the hospital to make sure the seeds do not move and accidentally expose a different area of the body to radiation. In some hospitals, people can receive brachytherapy as an “outpatient.” Instead of keeping the radiation seeds in place for a week or so, high-dose-rate radiation seeds can be placed in the catheters using specialized equipment. The seeds are placed near the treatment site for about 15 to 30 minutes and then removed. This is done once or twice a day. This process may allow some patients to go home between radiation treatments. Proton therapy is a type of external-beam radiation treatment that uses protons rather than x-rays. Like x-rays, protons can destroy cancer cells. It is most commonly used in parts of the body close to critical structures, for example near the spinal cord or at the base of the brain. Learn more about proton therapy. Radiation treatment using heavier charged particles, known as carbon-ion radiation therapy, is being studied for the treatment of sarcomas in Japan, Germany, and China. In some hospitals, part of the planned radiation therapy can be given during surgery. This approach can decrease the need to expose normal tissue to radiation from external-beam radiation or with brachytherapy. Side effects from radiation therapy depend on what part of the body receives radiation. They may include fatigue, mild skin reactions, upset stomach, and loose bowel movements. In the short term, radiation can cause injury to the skin that looks like a sunburn. This is usually treated with creams that keep the skin soft and help relieve discomfort. Radiation therapy can also affect wound healing. In the long term, radiation can cause scarring that affects the function of an arm or a leg. In rare cases, radiation can cause a sarcoma or other cancer. In the unlikely event that this happens, it takes an average of about 10 years after radiation for a second cancer to develop. Each person is encouraged to talk with his or her doctor about the possible risks and benefits of a specific treatment such as radiation therapy. Most side effects go away soon after treatment is finished. Newer radiation techniques, including proton therapy (see Latest Research), may help control sarcoma and cause fewer short-term and long-term side effects. Chemotherapy is medication that destroys cells that are growing and dividing. Cancer cells grow by dividing, and they grow faster than normal cells. However, normal cells also grow and divide, so the side effects of chemotherapy are due to the treatment’s effects on normal cells that are growing and diving. Chemotherapy is given by a medical oncologist, a doctor who specializes in treating cancer with medication. A chemotherapy regimen, or schedule, usually consists of a specific number of cycles given over a set period of time. A patient may receive 1 drug at a time or combinations of different drugs given at the same time. Chemotherapy for sarcoma can usually be given as an outpatient treatment. Chemotherapy is often used when a sarcoma has already spread. It may be given alone or in combination with surgery, radiation therapy, or both. For example, certain types of sarcoma may be treated with chemotherapy before surgery to make the tumor easier to remove. Chemotherapy given before surgery may be called by different names, including preoperative chemotherapy, neoadjuvant chemotherapy, or induction chemotherapy. If a patient has not received chemotherapy before surgery, chemotherapy may be given to destroy any microscopic tumor cells that remain after a patient has recovered from surgery. Chemotherapy given after surgery is called adjuvant chemotherapy or postoperative chemotherapy. Targeted therapy is a treatment that targets the cancer’s specific genes, proteins, or the tissue environment that contributes to cancer growth and survival, usually by blocking the action of proteins in cells called kinases. This type of treatment blocks the growth and spread of cancer cells while limiting damage to healthy cells. In October 2016, the U.S. Food and Drug Administration (FDA) gave accelerated approval for the use of olaratumab (Lartruvo) in combination with doxorubicin as the first treatment for people with STS who cannot be cured with radiation therapy or surgery. Doxorubicin is an anthracycline chemotherapy drug, so patients also must have a type of STS that can be treated with doxorubicin. Until now, doxorubicin and ifosfamide have been used together for this situation. Imatinib (Gleevec) is a type of targeted therapy called a tyrosine kinase inhibitor. It is the standard first-line treatment for GIST worldwide. Imatinib is approved for use for patients with GIST after initial surgery to try to prevent recurrence in patients who might have a high risk of recurrence. Imatinib is also approved for the treatment of patients with advanced-stage dermatofibrosarcoma protuberans (DFSP). Two other targeted drugs, sunitinib (Sutent) and regorafenib (Stivarga), are approved for the treatment of GIST when imatinib doesn’t work. Pazopanib (Votrient) is a type of targeted therapy called a multitargeted tyrosine kinase inhibitor. It received FDA approval to treat kidney cancer in 2006 and STS in 2012. Immunotherapy is generally not approved for the treatment of sarcomas because they have not been tested well enough. Many recent approved immunotherapy treatments involve “immune checkpoint inhibitors.” These drugs are given to take the brakes off the body’s natural immune response against the cancer in the body. The current methods of immunotherapy do have problems because these drugs also activate immune responses against normal body parts, a process called autoimmunity. Some of these drugs are approved to treat other cancers. However, if testing on your tumor shows that it has specific problems with repairing DNA damage, called microsatellite instability-high (MSI-H) or mismatch repair deficiency (dMMR; this occurs in less than 1% of sarcomas), then a checkpoint inhibitor called pembrolizumab (Keytruda) may be used. In uncommon situations, white blood cells can be trained to fight cancer. If a specific target can be identified in your cancer, specially engineered T cells from your own body are used to attack the cancer cells. This kind of immunotherapy is called chimeric antigen receptor (CAR) T-cell therapy. At present, these cellular treatments are given only in clinical trials for people with specific types of sarcoma. Before treatment begins, talk with your health care team about the possible side effects of your specific treatment plan and palliative care options. During and after treatment, be sure to tell your doctor or another health care team member if you are experiencing a problem, so it can be addressed as quickly as possible. Learn more about palliative care. Your treatment plan may include a combination of surgery alone, surgery plus radiation therapy, surgery plus chemotherapy, or chemotherapy alone. Rarely, when the tumor is not growing, a “watch and wait” approach, also called “active surveillance,” may be used. This means that the patient is closely monitored and active treatment begins only if the tumor begins to grow. Palliative care will also be important to help relieve symptoms and side effects. For most patients, a diagnosis of metastatic cancer is very stressful and, at times, difficult to bear. Patients and their families are encouraged to talk about how they are feeling with doctors, nurses, social workers, or other members of the health care team. It may also be helpful to talk with other patients, possibly through a support group. If the cancer does return after the original treatment, it is called recurrent cancer. It may come back in the same place (called a local recurrence), nearby (regional recurrence), or in another place (distant recurrence). If the sarcoma was originally in the arm or leg, the recurrence most commonly occurs in the lungs. Patients treated for sarcoma of the abdomen or torso are at risk for local, regional, or distant recurrence. Radiofrequency ablation is a technique where a needle is inserted into the tumor to destroy the cancer with an electrical current. This burns the tumor from the inside out. SBRT is the use of pinpointed radiation at very high doses over a few treatments to attack a specific small area of tumor. This is a useful technique because it uses fewer treatments and can be more precise than external-beam radiation therapy. Recovery from cancer is not always possible. If the cancer cannot be cured, it can often still be controlled, at least for a period of time. It is important to understand that patients can live with cancer in their body as long as it does not affect the function of a major organ. Therefore, the goal of treatment is to control the cancer and preserve organ function. If the cancer can no longer be controlled, it is called end-stage or terminal cancer. This diagnosis is stressful, and advanced cancer is difficult to discuss for many people. However, it is important to have open and honest conversations with your doctor and health care team to express your feelings, preferences, and concerns. The health care team is there to help, and many team members have special skills, experience, and knowledge to support patients and their families. Making sure a person is physically comfortable and free from pain is extremely important. Patients who have advanced cancer and who are expected to live fewer than 6 months may want to consider a type of palliative care called hospice care. Hospice care is designed to provide the best possible quality of life for people who are near the end of life. You and your family are encouraged to talk with the health care team about hospice care options, which include hospice care at home, a special hospice center, or other health care locations. Nursing care and special equipment can make staying at home a workable option for many families. Learn more about advanced cancer care planning. Doctors and scientists are always looking for better ways to care for patients with sarcoma. To make scientific advances, doctors create research studies involving volunteers, called clinical trials. In fact, every drug that is now approved by the U.S. Food and Drug Administration (FDA) was tested in clinical trials. Patients decide to participate in clinical trials for many reasons. For some patients, a clinical trial is the best treatment option available. Because standard treatments are not perfect, patients are often willing to face the added uncertainty of a clinical trial in the hope of a better result. Other patients volunteer for clinical trials because they know that these studies are a way to contribute to the progress in treating sarcoma. Even if they do not benefit directly from the clinical trial, their participation may benefit future patients with sarcoma. Doctors are working to learn more about sarcoma, ways to prevent it, how to best treat it, and how to provide the best care to people diagnosed with this disease. The following areas of research may include new options for patients through clinical trials. Always talk with your doctor about the best diagnostic and treatment options for you. Immunotherapy. Immunotherapy comes in many forms. Immune checkpoint inhibitors have become the focus of a lot of research. These drugs are targeted monoclonal antibodies (proteins) that turn on immune responses in the body by taking the brakes off the immune system. The molecules that are blocked have names such as CTLA4, PD-1, PD-L1, OX40, LAG3, and TIM3. This approach has proved helpful in treating many cancers and in research studies about sarcomas.Chimeric antigen receptor (CAR) T-cell therapy uses white blood cells from a patient’s blood to destroy cancer cells. The patient’s cells are removed the patient and then changed in a laboratory so they have specific proteins called receptors. These receptors allow those T cells to recognize the cancer cells. The changed T cells are grown in large numbers in the laboratory and returned to the patient’s body. Once in the patient’s body, these T cells seek out and destroy cancer cells. This technique shows the most promise when there is a known target on the sarcoma, such as in synovial sarcoma and myxoid-round cell liposarcoma. Clinical trials are investigating this exciting but complex form of immunotherapy.Vaccines against specific sarcoma proteins or other molecules are also being studied, often in addition to immune checkpoint inhibitors. Improved drug delivery. Some chemotherapies are incorporated into fat molecules called liposomes to improve the absorption and distribution of the drug in the patient’s body. Other new ways to get a chemotherapy into a cancer cell are being studied. For example, chemotherapy can be attached to proteins, so the chemotherapy can enter into the cancer cells. In some cases, these proteins are antibodies that target, or bind to, a specific marker on a cancer cell, so the chemotherapy is delivered only to cancer cells and not to normal cells, which can improve effectiveness and decrease side effects. New drugs. New medications are being developed and tested that may be effective in treating some subtypes of STS. Learn more about the process of drug development and approval. Targeted therapy (updated 12/2018). As explained in Treatment Options, several targeted therapies have been recently approved to treat specific types of sarcoma. This is an active area of research for sarcoma. A recent study examined using sorafenib (Nexavar) to treat a rare type of sarcoma called a desmoid tumor. Sorafenib is a tyrosine kinase inhibitor currently used to treat liver, thyroid, and kidney cancer. Of those who took sorafenib in the clinical trial, 87% had their disease stopped for more than 1 year. In this study, 18% of patients who took sorafenib had to stop taking the drug because of side effects. Another clinical trial looked at whether using the colony-stimulating factor-1 (CSF-1) inhibitor pexidartinib helped people with tenosynovial giant cell tumors. These are rare tumors that affect the tendons and joints of younger adults. Of the 61 people who took pexidartinib, the drug worked in 39.3% of them and improved their pain, range of motion, and physical function. Taking pexidartinib did cause serious side effects that affected the liver in some patients. Targeted oncogene treatments. Drugs are being researched that may block 1 or more of the proteins found in tumor cells that help the tumor grow and spread. Tumor genetics. Researchers are learning that some sarcomas have unique genetic “fingerprints.” Understanding these fingerprints may help doctors make precise diagnoses, determine better treatments, and possibly better predict a patient’s prognosis. A number of cancer centers and companies now offer genetic tests of cancers to determine whether people with sarcoma might benefit from newer treatments. Listen to a podcast from ASCO experts discussing highlights from the 2018 ASCO Annual Meeting. Your follow-up care may include regular physical examinations, medical tests, or both. Doctors want to keep track of your recovery in the months and years ahead. For patients treated for sarcoma in an arm or leg, a rehabilitation program after surgery or radiation therapy can help the patient regain or maintain limb function. Range-of-motion exercises, strengthening exercises, and a program to reduce lymphedema may be recommended. A rehabilitation medicine specialist can help patients receive the most appropriate rehabilitation after treatment. The majority of patients with a sarcoma in an arm or leg can be successfully treated and maintain good limb function. However, when treatment included amputation, services that provide artificial limbs, called prosthetics, and additional mental health support can help manage the adjustment to life following the loss of a limb. Learn more about rehabilitation. Some people with sarcoma have strong family histories of cancer in other relatives. If other relatives in your family have had cancer, then it may be advisable to meet with a clinical genetic expert. Clinical genetics experts can discuss what your diagnosis may mean for other people in your family who do not have cancer. Sometimes, special blood-test screening can determine who is at risk to develop cancer in a family. Learn more about genetic testing for cancer risk. ON THIS PAGE: You will find some helpful links to other areas of Cancer.Net that provide information about cancer care and treatment. This is the final page of Cancer.Net’s Guide to Soft-Tissue Sarcoma. Use the menu to go back and see other pages. This is the end of Cancer.Net’s Guide to Soft-Tissue Sarcoma. You may use the menu to choose a different section to read in this guide.